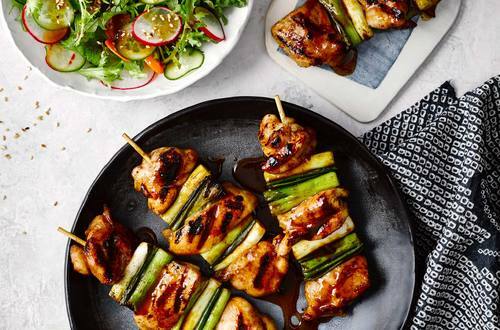 A touch of sweetness and a whole lot of flavour, these skewers are an ideal mid-week dinner that you can whip up in less than 30 minutes. 1 Prepare the sauce by simmering the recipe base, honey and water in a pot for 2 mins until the sauce is thick and sticky, reserve 1 tablespoon for your salad dressing. 2 Soak your wooden skewers in cold water so they don’t burn. Thread the chicken and shallots onto the skewers. 3 Using a brush, glaze the skewers with the cooled sauce. BBQ or grill the skewers on a strong heat, turning regularly so they cook evenly, brush with more sauce each time you turn them. 4 Toss the salad ingredients with some of your reserved sauce and sesame oil and serve with the skewers.